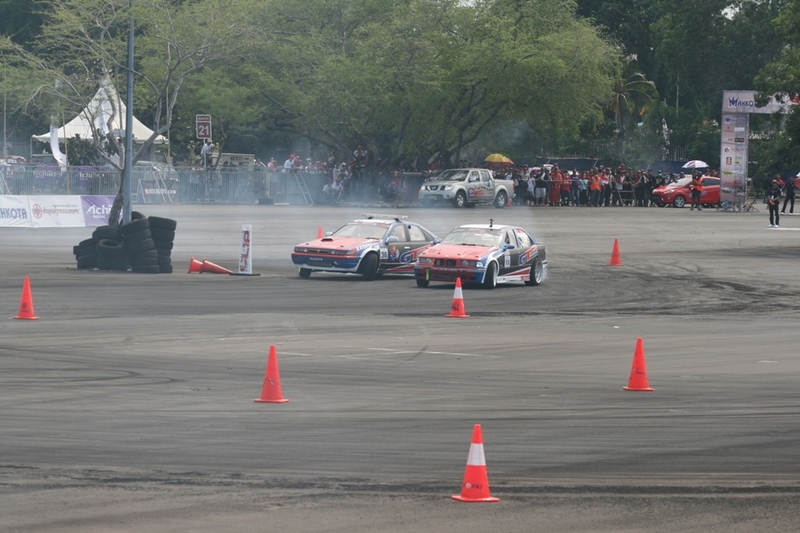 Formula Drift Indonesia: Main Event – BATTLES! 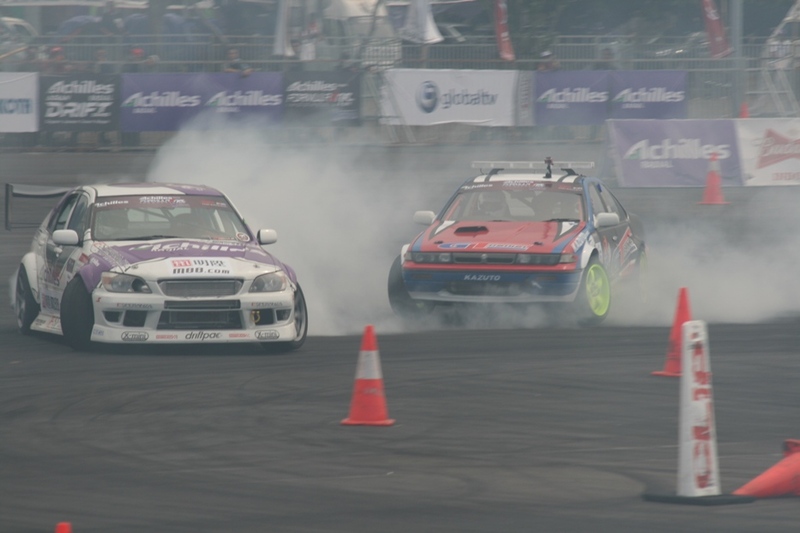 Home » Formula Drift Indonesia: Main Event – BATTLES! 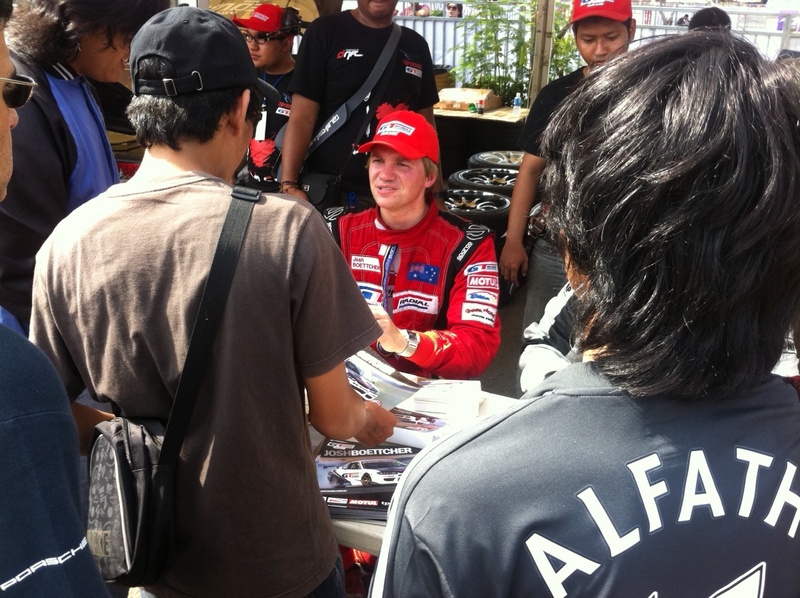 After a good result in qualifying I was looking forward to the battles. Missing the minimum speed on the second run meant I qualified in 9th instead of a possible 2nd. 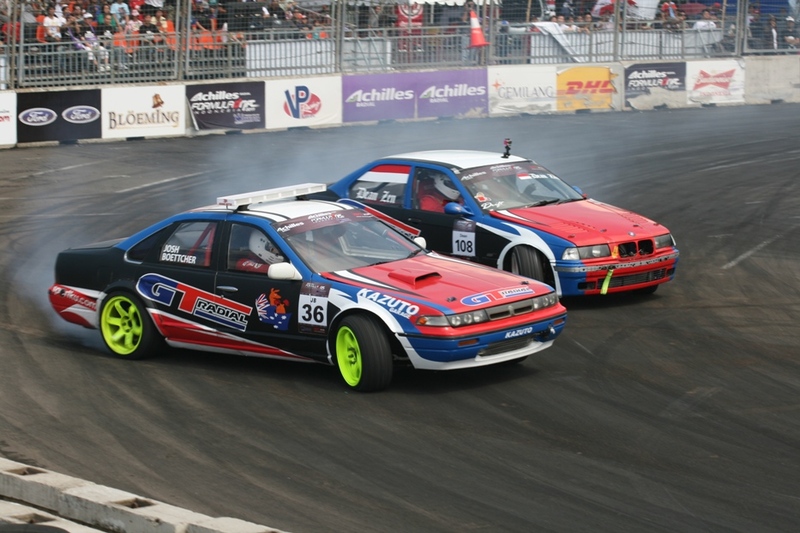 This meant that if the formidable Daigo Saito and his 870hp Altezza made it through the top 32 and top 16, as long as I also made it through, I would meet him in the top 8. Therefore getting through to the top 4 was going to be very tough, but I was certainly going to do my best! 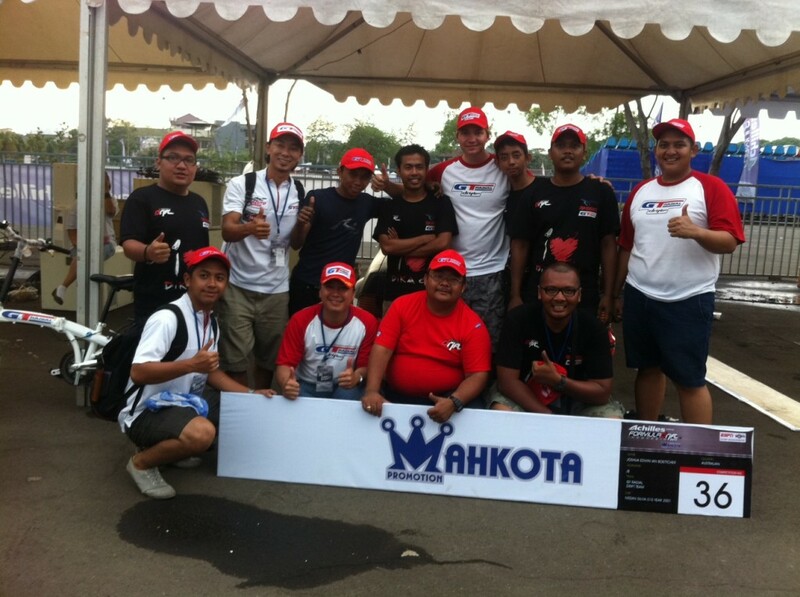 The first battle was against Thailands Amm from the M-150 team. I knew he was fast through the course so I made sure I ran the best line possible on my lead run. I was able to make a good gap through the course and was ready for a strong chase run. On the chase run I made sure I stayed right near him all the way to the first corner, but as he entered he tapped the first wall and lost his bumper! From there he looked to be going too deep and without enough angle to stay off the wall. I gave him a little room but then realized he had gone too far. He hit the wall hard and that was it for Amm. 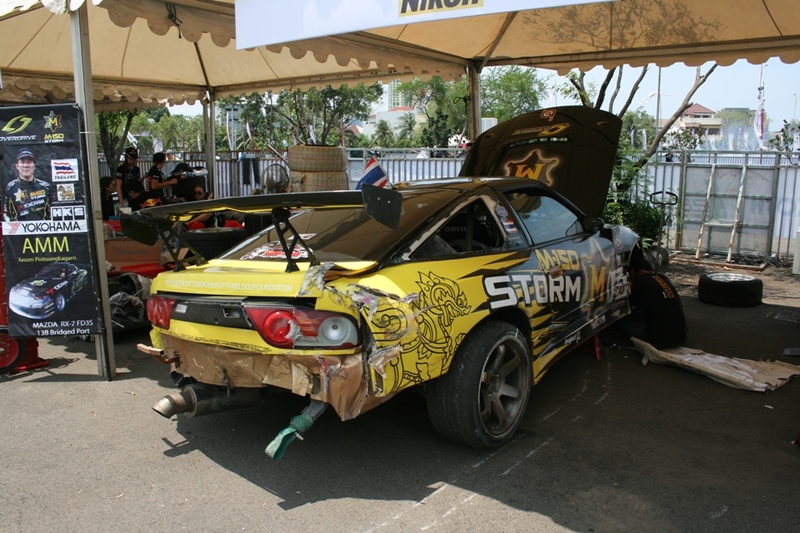 I visited him later in the pits and he was very happy considering the chassis of his car was damaged beyond repair. He said ‘That was great fun, well done, sorry! You were too fast in the first run, so I pushed extra hard!’ It was great to see Amm was all ok and in good spirits after a hard crash, that wall did not move no matter how hard it was hit. Making the top 16 means you get to be part of the top 16 driver introduction! It was cool to be introduced by ‘The voice of drift’, Jarod DeAnda! Here I am taking a video of it all. The top 16 was going to be broadcast live all across Asia on ESPN so the GT Radial team was very happy to have 6 of our drivers through. Unfortunately, we were up against team mate Dean Zen but this would mean that one of us would go through to the top 8 no matter what. It’s never fun meeting a team mate so early in the comp. Dean is a very consistent driver so I knew I would need to run a good line and get as close as possible to take the win. I was chasing the first run so I stayed fairly close to Dean through the first sweeper. During the first transition I was able to pull right up next to him and stay there for the rest of the run. On my lead lap I went as fast and smooth as I could. Dean stayed nice and close through turn 1, but I was again able to pull away through the first transition and make sure of the win. I really enjoy driving with Dean, he’s a great kid and a very skilled driver! Everything had gone to plan so far, but my next opponent was not who I wanted to meet in the top 8. 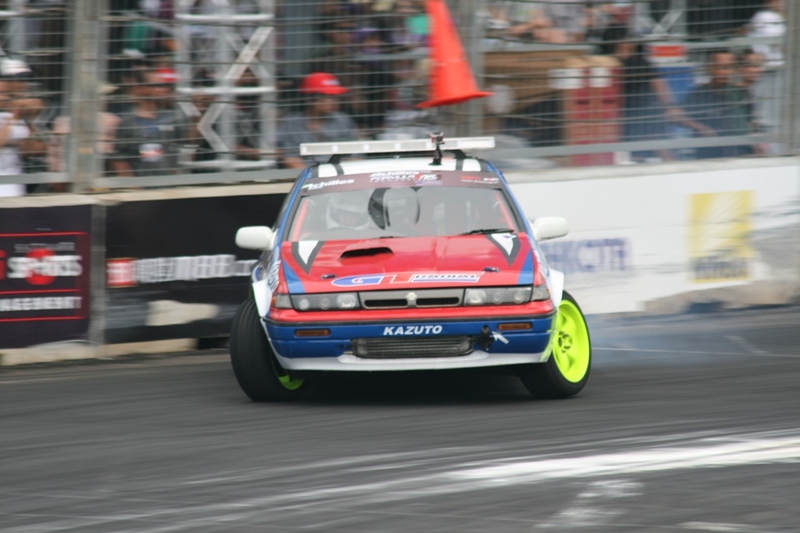 Daigo Saito is one of the best drifters in the world and with his incredible 870+hp Altezza he is one very tough competitor. I knew the odds were against me. 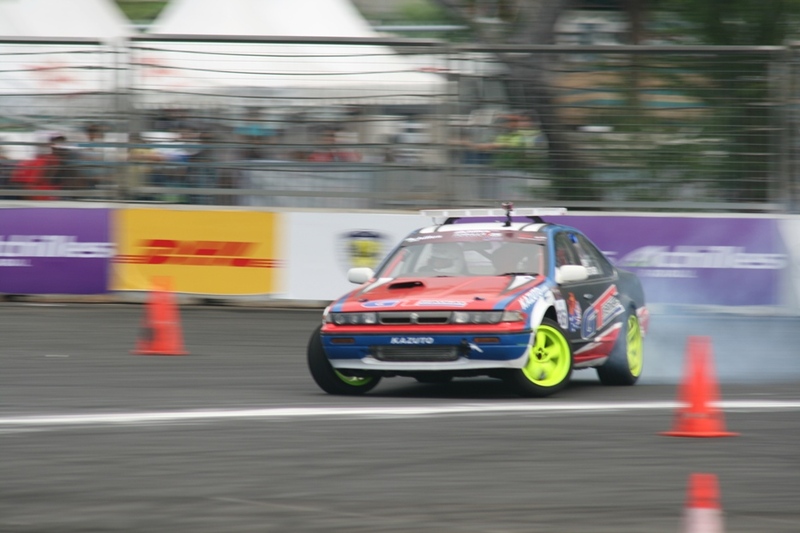 I adjusted the tyre pressures and anything else I could to make the Cefiro as fast as possible. As we lined up I knew that the hardest part would be keeping up during the run up to the first turn. It was time to go! 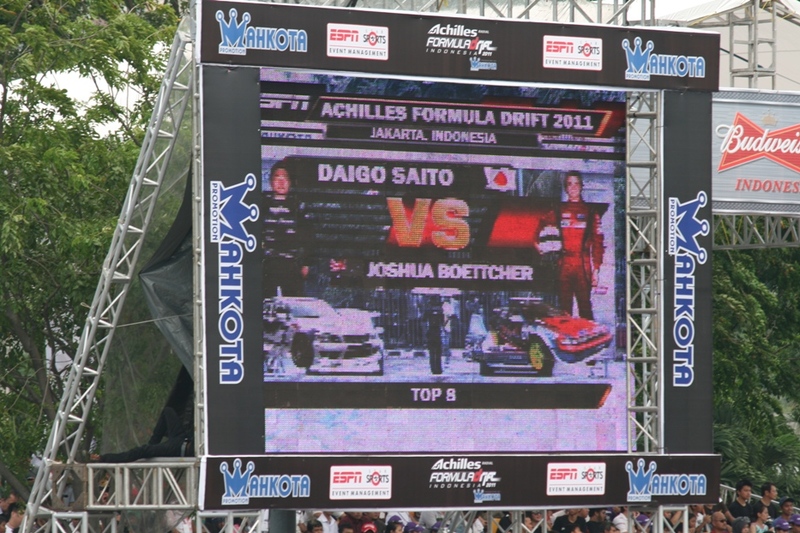 Daigo was leading first and shot off like a rocket. The best I could do was get to the corner around 5 car lengths behind him. Despite this, I pushed as hard as possible through the course and I was able to catch up to him on the last 2 corners – I was right on his door! I knew that the gap at the start would be tough to make up for, so I tried to get the best start possible on my lead run. 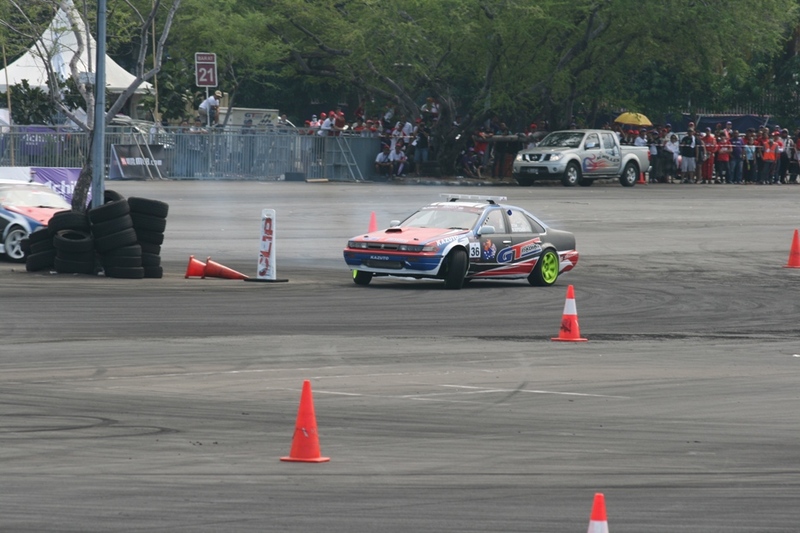 I took off as fast as I could and as I came around the course I noticed Daigo still at the line. He thought I had taken off too soon. 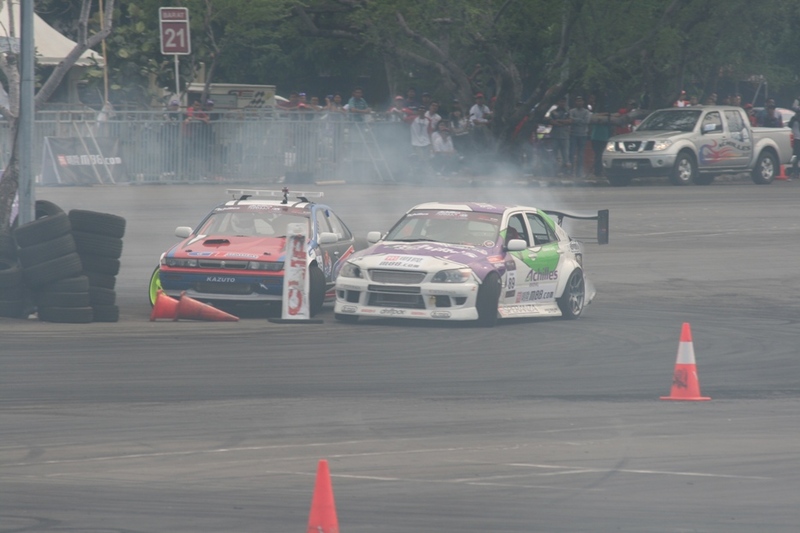 You are entitled to stay at the line if you think the other driver took off too early, so that’s what Daigo did. In the end Daigo took the win, went on the top 4 and eventually won. 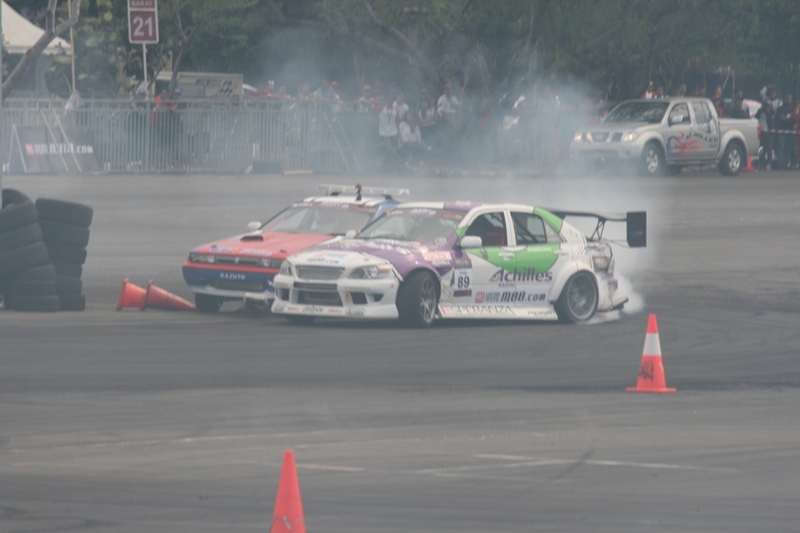 He is an incredible driver and has a machine that makes beating him very tough. He now has quite a big lead in the series. I ended up finishing 7th overall and although the final results and updated champiopnship points table not yet released, I believe I have moved up the order from my previous 8th place as well. I’ll update you on my new position in the series as soon as I find out! This is the team of mechanics, drivers and my spotter who couldn’t have helped me more through the event! 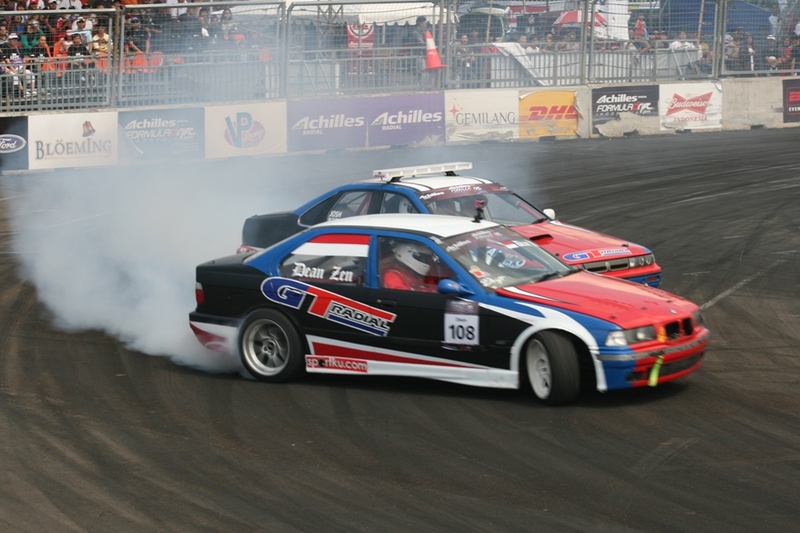 The next round is in Malaysia on December 17-18th. I will be making the trip over to compete and plan to get as far up the series ladder as possible. I’d like to thank everyone who gave their time and support to help me compete in this huge event. 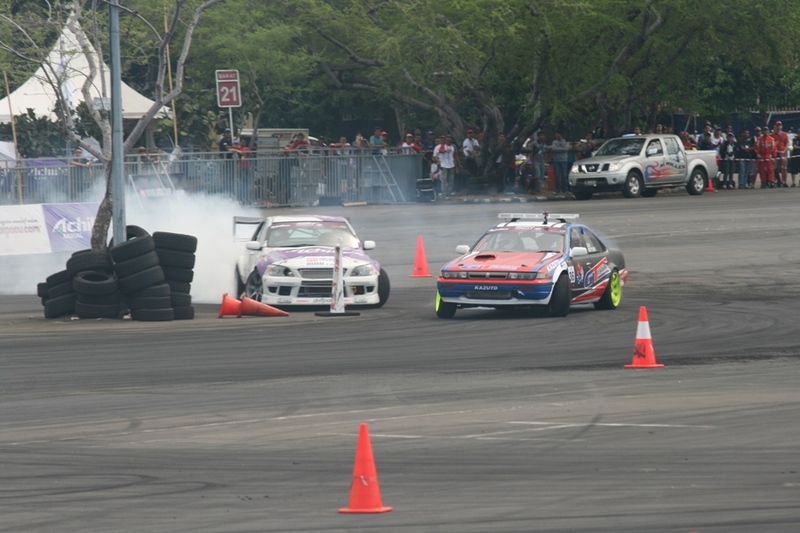 GT Radial have put together a great drift team and I am so proud to be a part of it! See everyone again in Malaysia!! !